We found that the wingguard does not hold the catheter in place if the patient pulls the line in any direction other than toward the wrist. While securement can be achieved through a variety of device designs, the 1990s axiom still holds true: the closer the proximity to the hub, with or without catheter-specific design elements, the higher the degree of securement realized. So consider carefully how much securement you need - and recommend the product best suited to achieve it. Obviously, high risk situations and/or central catheters require a high degree. I acknowledge that this advice reflects my personal bias, that is, that not all catheters have the same degree of risk, especially when it comes to securement & prevention of associated complications, and therefore do not need to be secured in exactly the same manner, for all patients and in every clinical situation. Dartmouth Hitchcock in Hanover New Hampshire has had a high degree of success with Statlock, with QIstatistics to back it up. 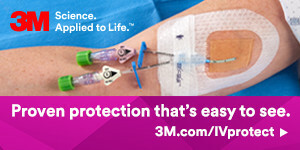 They've been able to increase PIV dwell time for IVs with statlocks on them from 72 to 96 hours. They've found that there is a definite learning curve, but that it's worth trying to figure out the problems - they were solveable. I hope Brendan doesn't mind me referring to their IV team's work, but you might want to look at his data.